Have you ever predicted that a project will take you an hour and be a total walk in the park? And then 3 weeks later you emerge from the cubicle-size space that has eaten you alive, covered in dust and sweat, and maybe even find a rogue meatball stuck to your sock? 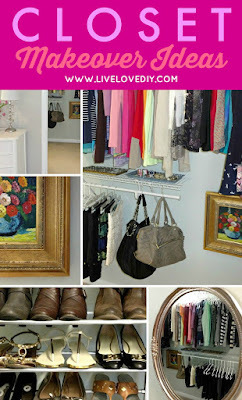 This is the story of our closet makeover. 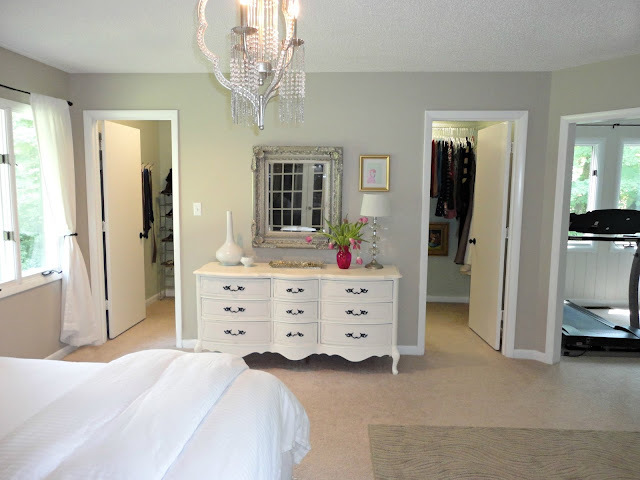 When we moved into this house, I was ridiculously excited over the large walk-in closet in the master bedroom. Pretty quickly though, I got sidetracked by the rest of the house, and the poor closet was totally neglected for over 3 years. Knowing that this space had so much potential absolutely drove me crazy every time I would look at it and see that. As time went on, it got more and more cluttered and just became a space that totally stressed me out. There was even a point where one of the shelves fell on the ground, as if to taunt me, and I just left it there. I rationalized that I had plenty of jorts to get me by for at least half the summer. 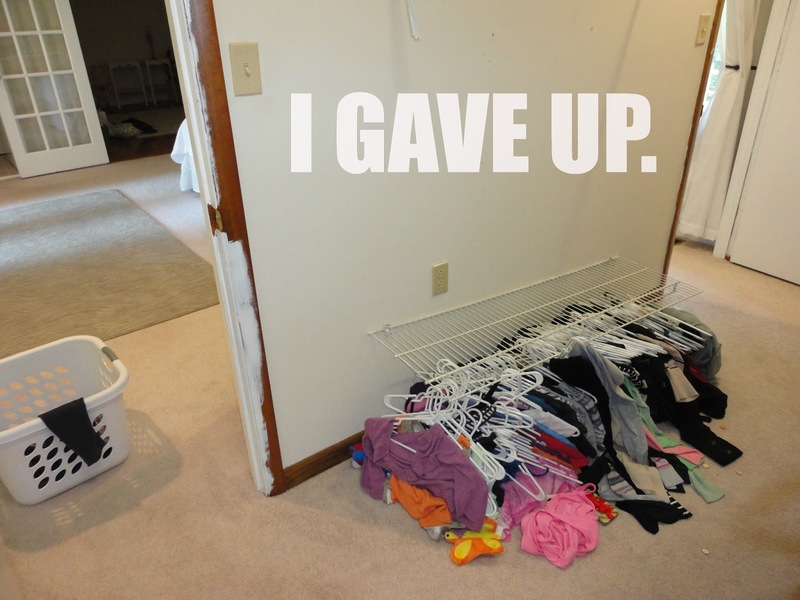 And that was the proverbial rock-bottom of my closet story. Finally (when I ran out of jorts), I decided that enough was enough and that I must rebuild this little city. Seriously, I had $50 for this makeover, so if you are expecting me to Lisa Vanderpump it on this one, take it down a notch. The first step was to de-clutter and remove everything from the closet. If you follow me on Instagram or Facebook, you may have seen this picture. That situation is what I have been staring at in the bedroom for the past few weeks. I spent the first week just taking everything out of the closet and sorting through it. I made three piles: a trash pile, a donate pile, and a keep pile. The keep pile ended up being really small, and I've gotta tell you. It feels amazing to have gotten rid of most of our stuff. 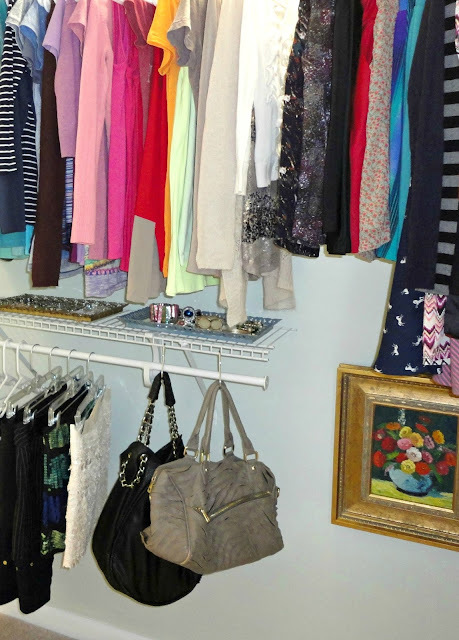 Clutter really depletes me of my energy, and simplifying our closet down to the bare bones feels great. Once all of our stuff was out, I surveyed the space and decided that painting the trim and walls would be the cheapest way that I could upgrade this blah space. Also, my striped jewelry corkboard did not thrive as well as I had hoped. Total bust. So, I spent the second week painting all of the trim white (tutorial here) and painting the walls a gorgeous blue-green (the same color that I used in the master bathroom). 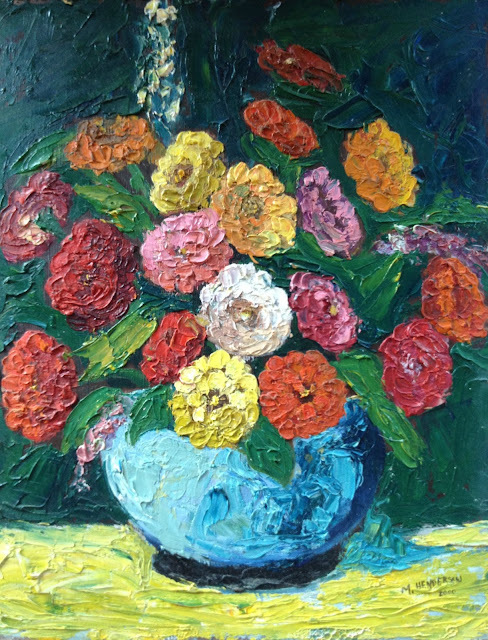 And once again my love for paint was realized. Painting the trim and walls totally transformed this space. Has anyone else ever experienced the small space phenomenon....where the smallest spaces are the most difficult to paint? And it makes no sense? I've painted my master bedroom 3 times and it took about 10% of the time that it took to paint this tiny box of a room. It puzzles me. After I was done painting, I spent the next week putting it all back together. 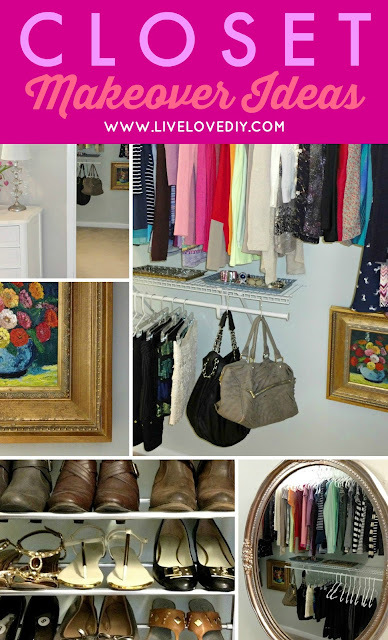 Here is what the closet looks like from the bedroom (Did you see last week's post about all my embarrassing mistakes while decorating this room?) 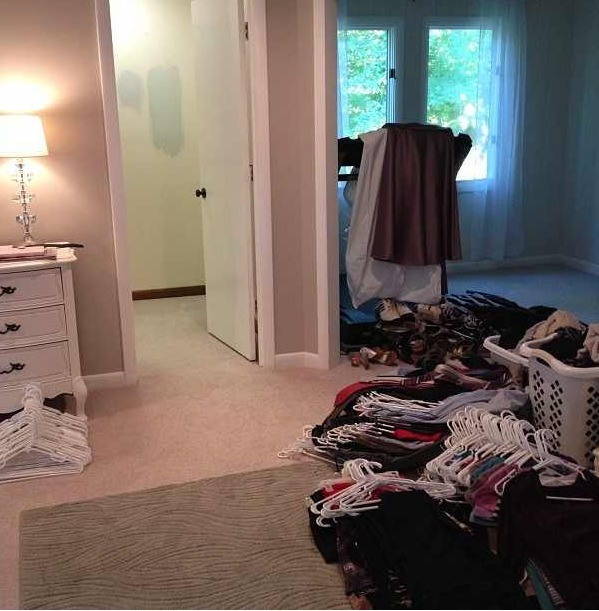 There are two doors, one on each side, and the closet goes the length of the room. Here is what you used to see when you walked into the door on the right. After I spent a week removing 80 tons of men's tshirts. Why do boys need so many tshirts? We kept the two long shelves on the long wall, keeping my stuff on the right (pants/handbags on the bottom and shirts on the top) and Jesse's stuff on the left (pants on the bottom, shirts on the top). 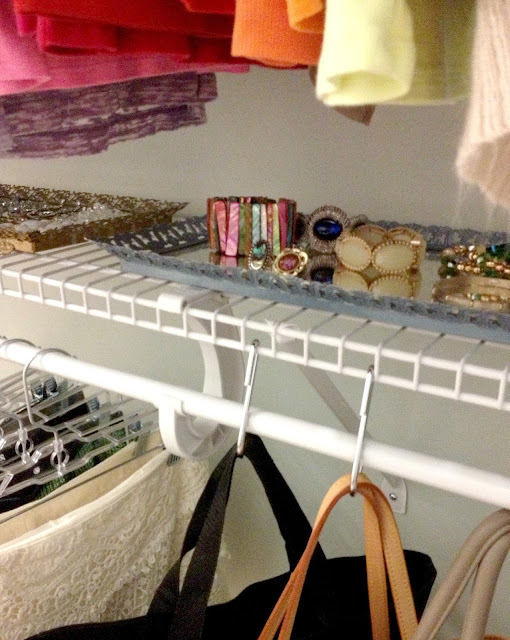 I also put a single rack on my side, hung near the top, so that I could hang all of my dresses on it. It's high enough that I can even hang my wedding dress on it. What is one supposed to do with a wedding dress after the wedding? Have a wedding dress party where everyone wears wedding dresses? Brave men are welcome to attend. I wanted the closet to feel kinda like a dressing room, so I added a few extra details. 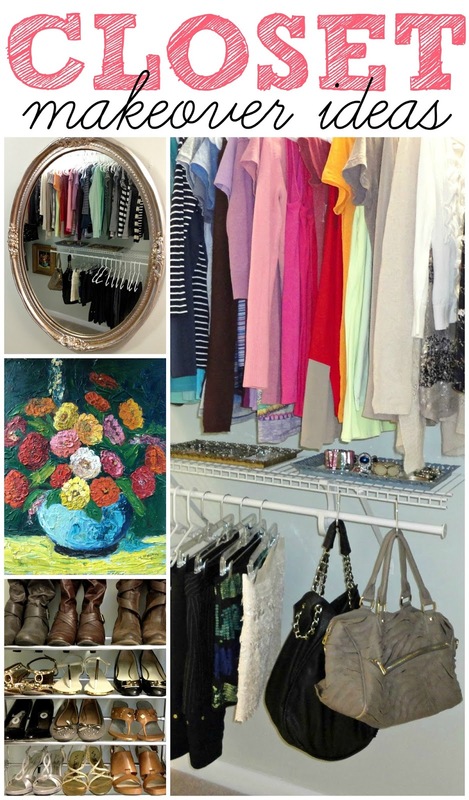 I hung a painting by my grandmother beneath the dresses. 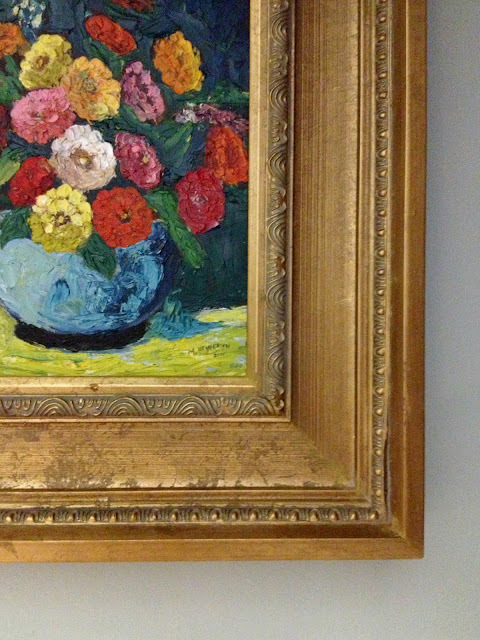 I found a great frame at the salvage yard for $10 and it was the perfect fit. I love having one of her paintings hanging somewhere unexpected, where I can enjoy it every single day. It makes this space so much more special. And remember the wall I gave up on? I decided against rehanging that shelf. We got rid of so much stuff that it was no longer needed. In its place, I hung a pretty mirror (that I found here) above the striped bench that I made from an old piano bench. I also added a furry shag rug. Combined with the bench and mirror, it really makes this space feel more like a dressing room, and less like a closet. In normal life, there are usually two laundry baskets, one on each side of the bench. Jesse does his laundry. I do mine. We are 12 years going strong with that magical recipe of laundry equality. Since I didn't have a huge budget to go out and buy all new organization stuff with, I decided to organize our stuff with items we already owned. 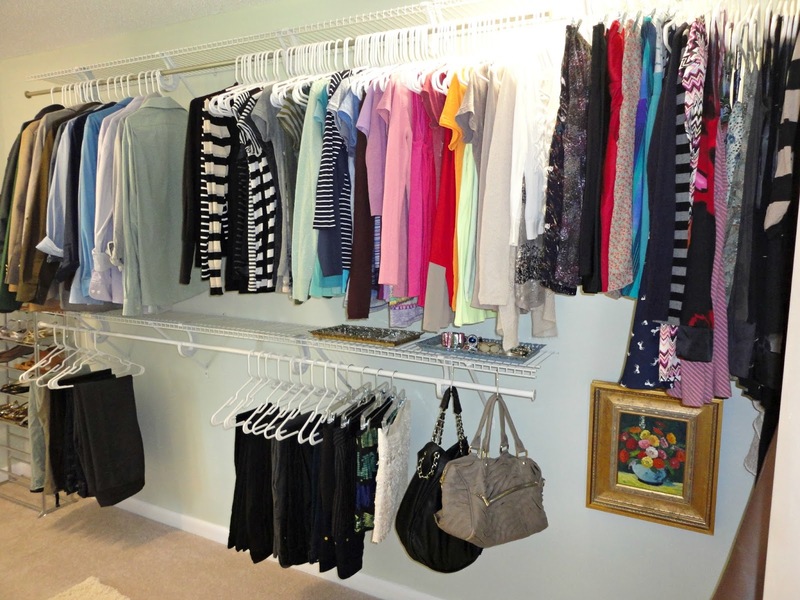 I started out by using all of the same type of hangers, and organizing by color. 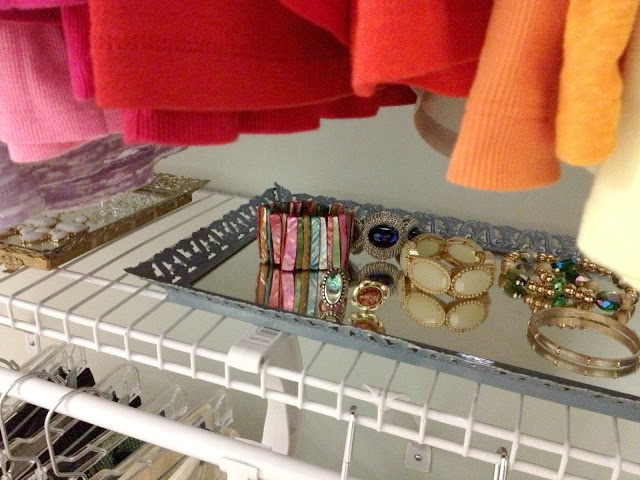 And then eventually added these magical little hangers. 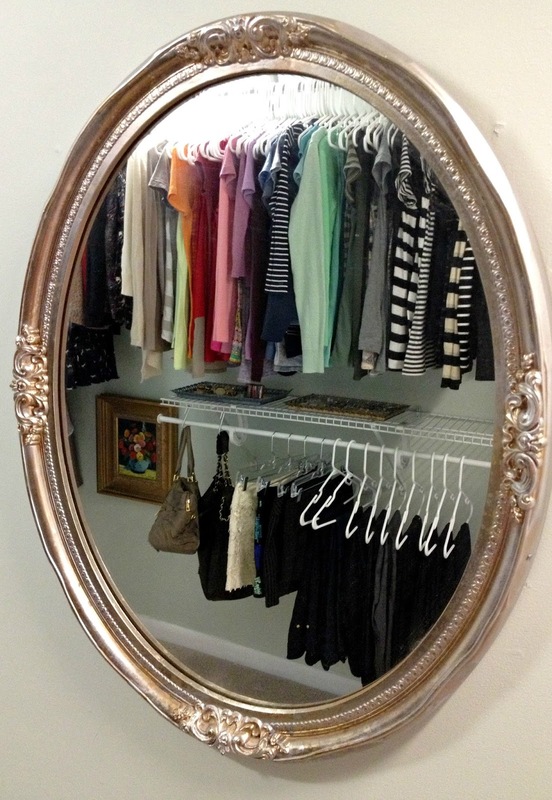 Our closet has stayed clean and organized for almost a full week now. Miracle. For hanging handbags, I used leftover hooks from this. You can also use shower curtain hooks that you can get anywhere for about $5. 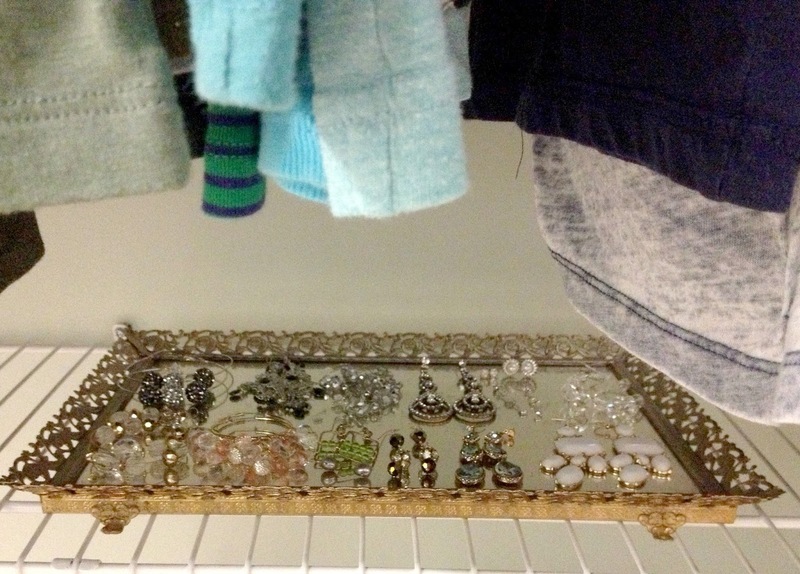 I used two mirrored trays, both from thrift stores, to house my jewelry. I used one for bracelets and rings. I spray painted that one frame blue awhile back. Not my finest spray paint moment. 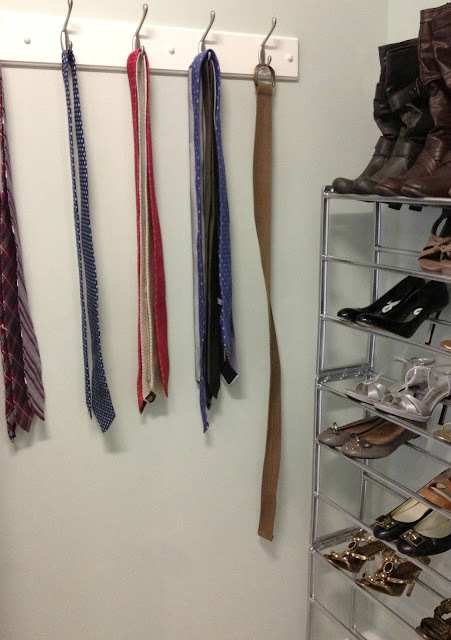 I used a coat rack to organize all of Jesse's ties, belts, and the occasional smelly hat. 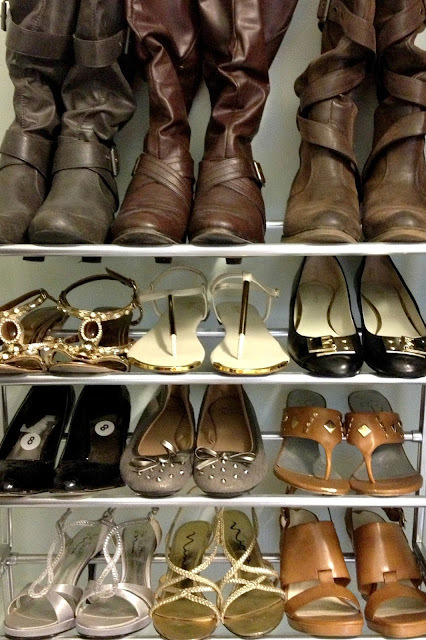 And then I found a white plastic shoe rack at Target and spray painted it chrome silver to look like metal. It's no dream shoe situation, but it's better than their former home, which was in a pile on the floor. Also, handy trick I just read about the other day. Did you know you can use pool noodles to stuff in your boots and make them stand up? I'm totally doing that soon. And that, my friends, is the closet! It was a small makeover that took three weeks off my life, but ultimately it's been one of the best updates I've made to this house. There's something about this space that just makes me happy. If you're feeling overwhelmed about where to start, just know that that is totally normal. Closets are overwhelming by nature. They can't help it. Try starting with the three piles: trash, donate, keep. Take everything out of your closet and put each item it the pile it belongs in. 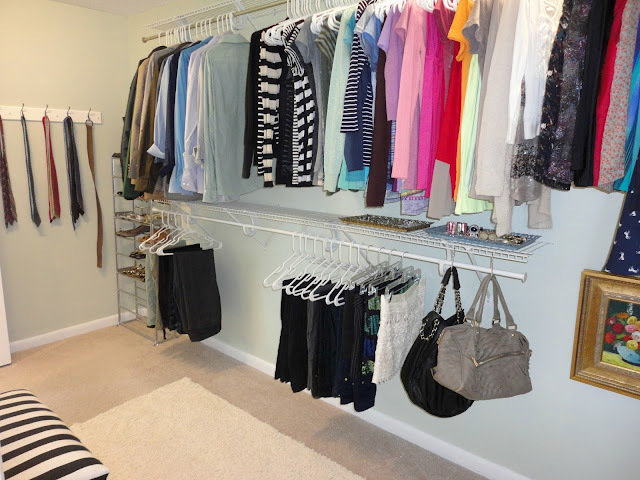 When the closet it empty, look at it as a blank canvas and try to treat it as you would any other room. Decorate it, paint it, dance in it....doesn't matter.